In order to convince my son to get out of the heat and come inside and enjoy the air conditioning, I told him that I would put together his Bird Sensory Tote. A few months ago I participated in a swap with a group of women to create the perfect bird themed sensory tub. I ended up holding off on putting this one together because we had so many set up. 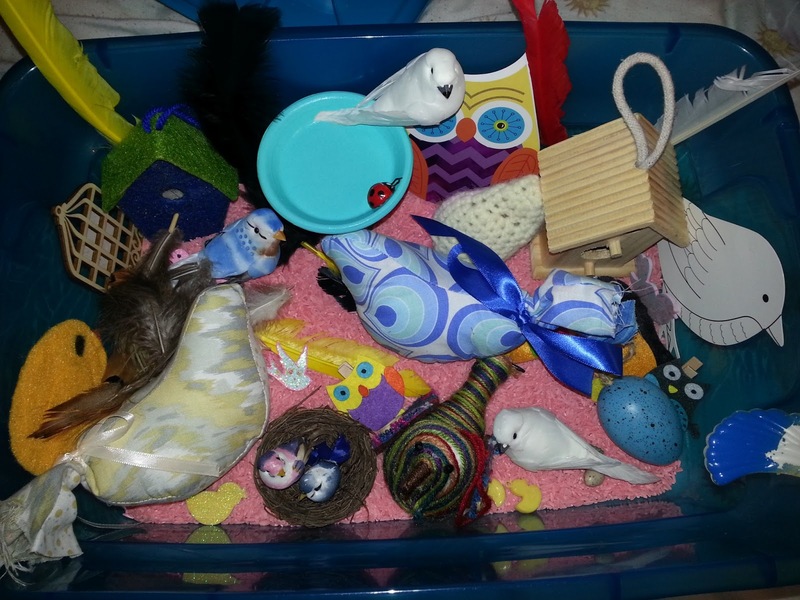 For those of you that do not know what a sensory tub/tote is, it is a tub or a bin that you fill up with various items to let your child be hands-on. Sensory activities provide children with another meaningful avenue of learning. There are handmade birds, bird houses, a wooden cutout of a bird cage, a bird bath, owls, bird eggs, birds toob, nests, feathers, and more. My filler is colored rice because I forgot to pick up bird seed, otherwise it would have been bird seed. My son is enjoying this-- all you hear is TWEET TWEET! Check out our spring sensory tub and our butterfly sensory tub too! Very cool idea for the little ones, Magena. Hope you'll follow on mine as I am on yours. I have both these same follow gadgets too. Following on both.